Whereas ESO's Very Large Telescope (VLT) can observe very faint astronomical objects in great detail, when astronomers want to understand how the huge variety of galaxies come into being they must turn to a different sort of telescope with a much bigger field of view. The VLT Survey Telescope (VST) is such a telescope. It was designed to explore vast swathes of the pristine Chilean night skies, offering astronomers detailed astronomical surveys (https://www.eso.org/public/teles-instr/paranal-observatory/surveytelescopes/vst/surveys/ ) of the southern hemisphere. 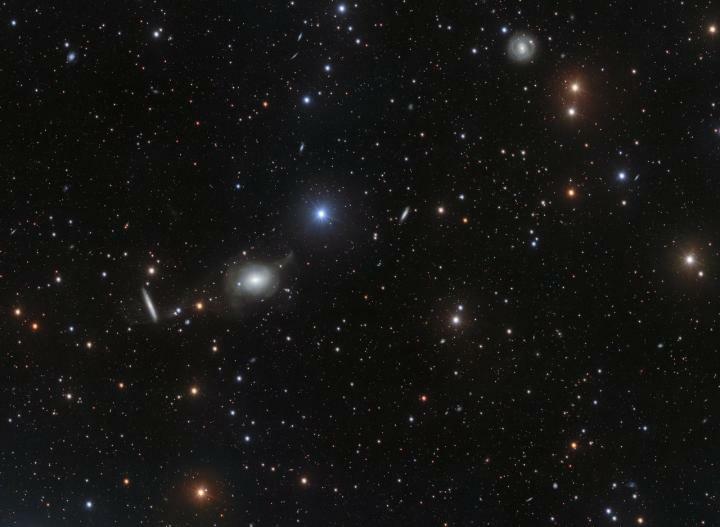 One of these galaxies is NGC 5018, the milky-white galaxy near the centre of this image. It lies in the constellation of Virgo (The Virgin) and may at first resemble nothing but a diffuse blob. But, on closer inspection, a tenuous stream of stars and gas — a tidal tail — can be seen stretching outwards from this elliptical galaxy. Delicate galactic features such as tidal tails and stellar streams are hallmarks of galactic interactions, and provide vital clues to the structure and dynamics of galaxies. As well as the many elliptical (and a few spiral) galaxies in this remarkable 400-megapixel image, a colourful variety of bright foreground stars in our own Milky Way Galaxy also pepper the image. These stellar interlopers, such as the vividly blue HD 114746 near the centre of the image, are not the intended subjects of this astronomical portrait, but happen to lie between the Earth and the distant galaxies under study. Less prominent, but no less fascinating, are the faint tracks left by asteroids in our own Solar System. Just below NGC 5018, the faint streak left by the asteroid 2001 TJ21 (110423) — captured over several successive observations — can be seen stretching across the image. Further to the right, another asteroid — 2000 WU69 (98603) — left its trace in this spectacular image. While astronomers set out to investigate the delicate features of distant galaxies millions of light-years from Earth, in the process they also captured images of nearby stars hundreds of light-years away, and even the faint trails of asteroids only light-minutes away in our own Solar System. Even when studying the furthest reaches of the cosmos, the sensitivity of ESO telescopes and dark Chilean skies can offer entrancing observations much closer to home. VEGAS is a deep multi-band imaging survey of early-type galaxies carried out with the VLT Survey Telescope (VST), led by Enrichetta Iodice from INAF-Astronomical Observatory of Capodimonte in Naples, Italy. Elliptical galaxies are also known as early-type galaxies, not because of their age, but because they were once thought to evolve into the more familiar spiral galaxies, an idea now known to be false. Early-type galaxies are characterised by a smooth ellipsoidal shape and usually a lack of gas and active star formation. The bewildering diversity of shapes and types of galaxy is classified into the Hubble Sequence. OmegaCAM is an exquisitely sensitive detector formed of 32 individual charge coupled devices, and it creates images with 256 million pixels, 16 times greater than the ESA/NASA Hubble Space Telescope (http://www.spacetelescope.org/about/ )'s Advanced Camera for Surveys (ACS. OmegaCAM was designed and built by a consortium including institutes in the Netherlands, Germany and Italy with major contributions from ESO. This research was presented in the paper "VEGAS: A VST Early-type GAlaxy Survey. III. Mapping the galaxy structure, interactions and intragroup light in the NGC 5018 group" by Marilena Spavone et al., to appear in the Astrophysical Journal. The team is composed of Marilena Spavone (INAF-Astronomical Observatory of Capodimonte, Naples, Italy), Enrichetta Iodice (INAF-Astronomical Observatory of Capodimonte, Naples, Italy), Massimo Capaccioli (University of Naples, Naples, Italy), Daniela Bettoni (INAF-Astronomical Observatory of Padova, Italy), Roberto Rampazzo (INAF-Astronomical Observatory of Padova, Italy), Noah Brosch (The Wise Observatory and School of Physics and Astronomy Tel Aviv University, Israel), Michele Cantiello (INAF-Astronomical Observatory of Teramo, Italy), Nicola R. Napolitano (INAF-Astronomical Observatory of Capodimonte, Naples, Italy), Luca Limatola (INAF-Astronomical Observatory of Capodimonte, Naples, Italy), Aniello Grado (INAF-Astronomical Observatory of Capodimonte, Naples, Italy), Pietro Schipani (INAF-Astronomical Observatory of Capodimonte, Naples, Italy).